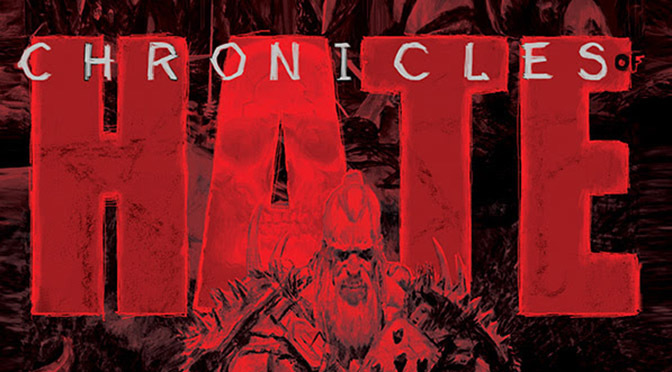 This December, following the wildly successful Kickstarter campaign for the HATE board game, Image/Top Cow will release an oversized trade paperback edition of CHRONICLES OF HATE, collecting books one and two of internationally renowned artist Adrian Smith’s dark fantasy series. Smith first came to prominence for his atmospheric, moody artwork and game illustrations for such popular franchises as Magic: The Gathering and Warhammer. In a world where the sun is frozen and the moon burns, CHRONICLES OF HATE follows an unlikely hero who rises to free the Earth Mother from her chains. This isn’t a world for the weak. All we know is HATE. CHRONICLES OF HATE, COLLECTED EDITION (Diamond code: OCT180056, ISBN: 978-1-5343-1144-2) hits comic book stores on Wednesday, December 5th and bookstores on Tuesday, December 11th. It can be preordered via Amazon, Barnes & Noble, Books-A-Million, Indiebound, and Indigo. CHRONICLES OF HATE, COLLECTED EDITION will also be available for purchase across many digital platforms, including the official Image Comics iOS app, Amazon Kindle, Apple Books, comiXology, and Google Play.